What is the purpose of the Set of 5 Recycling Bins? 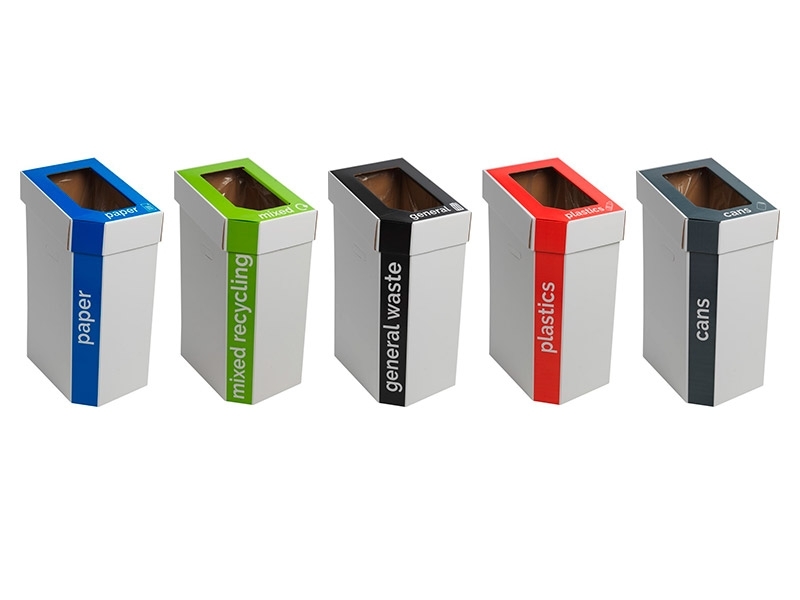 Providing an area to keep the environment clean and green is the goal with this Set of 5 Recycling Bins. They will fit easily in your work place and are clearly marked so that your employees and visitors will be able to toss their recyclables into the correct receptacle for processing. It will keep your area clutter free and environmentally sound. The Set of 5 Recycling Bins are an excellent choice for lunch or break rooms, mailrooms and open work areas as well as large gatherings at private residences. These clearly marked receptacles can also be added to construction and worksites to encourage all who are there to toss their appropriate refuse into the right containers for pick-up. Also, school cafeterias are a great place to display these to point students in the right direction for recycling. The bins fit together well, so they can slide into a variety of areas to be unobtrusive, yet are vivid and clearly marked so they will be noticeable enough to remind people to dispose of their refuse in the correct fashion. Everyone who is based or visiting a location where these are situated will find them easy to use. This means that employees, students, janitors and housekeeping will be able to toss their recyclable items into the bins. Also party guests and the host and hostess of a large get together will engage with this very sleek and well-appointed Set of 5 Recycling Bins. 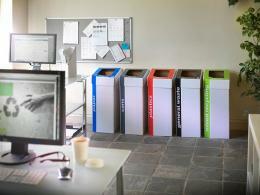 Our Set of 5 Recycling Bins is in itself recyclable. Made of 100% recyclable board, they come in packs of 5 with all that you will need to easily put together a cohesive and effective receptacle. There are 5 different categories provided with the bins to designate what kind of materials go into which one for recycling: Paper, Mixed Recycling, Plastic Bottles, General Waste and Cans. This helps in ensuring that these will already be separated for subsequent pick-up by whatever provider processes your recyclables. 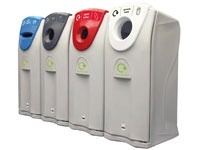 As with most of our products, the Set of 5 Recycling Bins come with free delivery and a 1-year warranty. They are locally made in Britain and will arrive at your location within 5 working days. 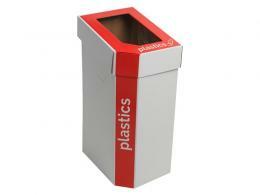 These are a quick and easy solution to ensuring your success with adhering to the EU recycling requirements.